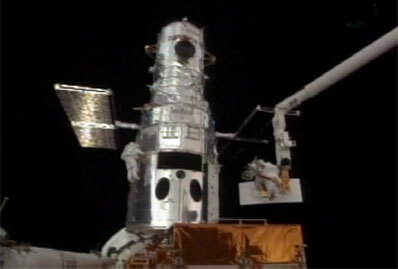 In a make-or-break attempt to free a stuck bolt holding an old camera in place on the Hubble Space Telescope, astronaut Andrew Feustel, anchored to the end of the shuttle Atlantis' robot arm, used old-fashioned elbow grease to save the day, releasing the bolt and clearing the way for installation of a powerful new camera. If the bolt had snapped - and that was a possibility - the astronauts would have been unable to remove the 16-year-old Wide Field Planetary Camera 2. In that case, the new $126 Wide Field Camera 3 would have been returned to Earth aboard Atlantis in a major disappointment for the Hubble team. But after removing a torque limiter from his wrench and applying more muscle power, Feustel was able to loosen the bolt to the relief of concerned flight controllers. He and partner John Grunsfeld then removed the old camera without incident. Dubbed "the camera that saved Hubble" by project scientists, WFPC 2 took most of the spectacular photos that have made Hubble a national icon since it was installed in the telescope during the first servicing mission in 1993. "It's been in there for 16 years, Drew, and it didn't want to come out," Grunsfeld said. Feustel first attempted to back off the bolt using the torque limiter and was unsuccessful. Grunsfeld returned to the shuttle airlock, retrieved additional tools and sockets and Feustel tried again. And again, he was unsuccessful. "Drew, do you have any other suggestions before I check with Houston?" astronaut Mike Massimino called from inside the shuttle. "No, I'm afraid I don't. I'm out," Feustel said. Working through a contingency checklist, Feustel then removed the torque limiter from his wrench - the device that was limiting the applied torque to 45 inch pounds - before trying to apply more elbow grease directly to the stuck bolt. "Houston, Atlantis ... we know the failure torque on this bolt is 57.1 foot pounds," Massimino radioed. "He had the MTL (multi-setting torque limiter) set at 45. What the crib sheet says if we don't get it to break (loose) here, we're going to reconnect the ground strap and blind mate connector. So I guess Drew's just wondering how hard he should try on this A latch? If you have any words for us, we'd appreciate it." "Atlantis, Houston, we copy that. And thanks for asking," replied Dan Burbank in mission control. "There's actually no issue with having the latch taken all the way to the failure point. The instrument should still function. So Drew can have at it, and you're correct, if we get to that point, we will need to reconnect the ground strap blind mate connector and we'll just leave it as is." "So in other words, he can use what he needs from his strength to try to break the torque, is that what you're telling us?" Massimino asked. "That's exactly right," Burbank said. "And as soon as he does, if he's successful, starts to have some motion in the latch, we'd like to go ahead and stop at that point." "OK, but I think we understand if it breaks, then Wide Field (Planetary Camera 2) stays in," Grunsfeld chimed in, verifying the make-or-break nature of the next step. "What john said is correct," Burbank confirmed. "OK, here we go," Feustel said, attaching the socket, sans torque limiter, to the attach bolt. Then, a moment later: "I think I got it! It turned, it definitely turned. And it's turning easily now." "OK, Atlantis, Houston, for EVA, we copy, that's great news," Burbank said. A few minutes later, Feustel attached a power wrench and backed the bolt out all the way to free the camera. "Woo hoo, it's moving out" he said. "That's great news," Massimino said. "That's awesome." With astronaut Megan McArthur operating the robot arm from inside the shuttle's crew cabin, Feustel carefully pulled WFPC 2 out of the space telescope at just before 11 a.m. to accomplish the first primary objective of today's spacewalk. After securing the camera on the side of the payload bay, he and Grunsfeld will retrieve the new Wide Field Camera 3 from its storage container in the shuttle's cargo bay so it can be installed in the telescope in place of WFPC 2. Earlier today, Feustel provided a brief report on contamination that was spotted on the WFC 3 carrier box after launch. "For you in Houston, just looking at the front of the W-SIPE (Wide Field Camera scientific instrument protective enclosure), I don't really see any of those particles, there's maybe a really small amount of what kind of looks like dust, but it's pretty minor," Feustel reported. "It's almost imperceivable. I can see some few particles on the front of the W-SIPE, little, whitish, grey looking, real small. It's low density, too."